France have won their second World Cup after winning their first in 1998 on home turf. Croatia regained their hope with 21 minutes remaining as Mandzukic capitalized on an error by Lloris and tapped the ball past the goalkeeper into an empty net. 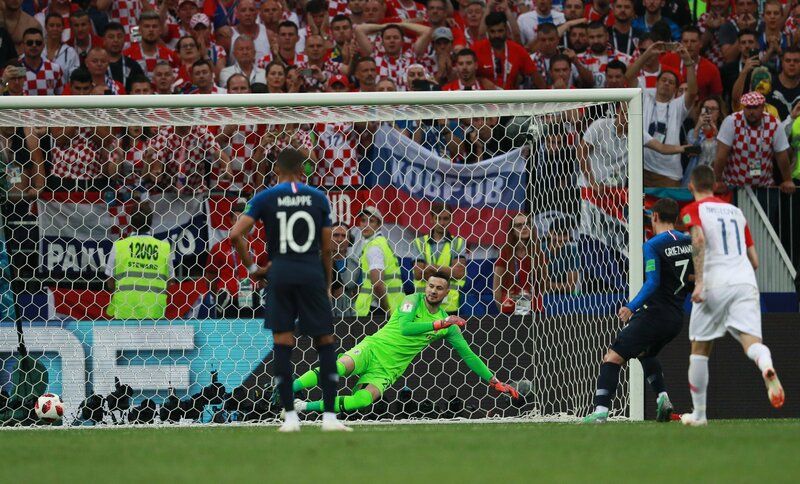 Paul Pogba made it 3-1 for France in the 59th minute with a fine left-footed strike leaving Croatia goalkeeper Danijel Subasic helpless, after his initial shot was blocked. Just six minutes later, 19-year-old Kylian Mbappe made it 4-1 with a beautifully made shot into the bottom corner of the goal. In the 38th minute, referee Nestor Pitana pointed to the penalty spot for a handball by Perisic after consulting a video assistant referee (VAR). The penalty was calmly executed by Griezmann. France striker Antoine Griezmann was named the man of the match after making it 2-1 in the France-Croatia match, the first penalty kick at a World Cup, in the 38th minute. Hernandez slid into Rebic on the right flank, receiving a yellow card in the 41st minute. Kante received a yellow card in the 27th minute of the match. The deadlock was broken in the 18th minute when Croatia striker Mario Mandzukic scored an own goal after he diverted Antoine Griezmann's free-kick into his own net. Mandzukic became the first player to score an own goal at a World Cup final. Four people ran onto the field during the second half of the match, stopping the game for a minute. France, who are looking to lift their second World Cup trophy, are squaring off against Croatia in the final in Moscow's 78,000-seat Luzhniki Stadium. The Video Assistant Referee (VAR) system was used for the first time in a FIFA World Cup final during the final game of the 2018 FIFA World Cup between France and Croatia. In the semi-finals, Croatia earned a hard-fought 2-1 victory over England through Mario Mandzukic's goal in the 109th minute to secure their spot in the finals. Croatia, whose previous best was a third-place finish at the 1998 World Cup, have advanced to the final for the first time in their history. France's national team defeated the Belgian squad 1-0 to reach the finals. France, which claimed the country's only other World Cup title on home turf in 1998, played in their third final in 20 years. The team's current head coach Deschamps was the captain of the World Cup-winning squad back in 1998.